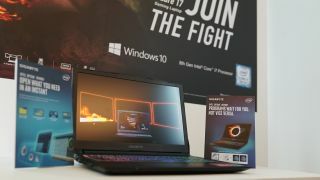 Gigabyte has refreshed its Sabre series of gaming notebooks, making some juicy additions on the hardware front. At Computex 2018 they saw upgrades to 8th-gen Intel processors, and what’s more offering what it claims is a ‘world first’ in the form of an option on the Core i7+ platform supporting Intel’s Optane memory. Optane, at least in this form (it also comes as traditional memory sticks now), essentially gives you a small amount of cache to turbo charge a traditional spinning hard drive. This means you can get SSD-like boot times and application launching without having to shell out the money for a solid-state drive. The screen has also seen an upgrade to displays with a 3ms response time and 120Hz refresh rate to keep those frame rates fluid. Those are some useful improvements indeed, and the refreshed Sabre gaming notebooks also now have Thunderbolt 3 ports on board, alongside HDMI and mini-DisplayPort connectors. Gigabyte didn’t mention any launch date or potential price point as of this writing.